Enjoying all the useful information on Hong Kong Trip Guide? Download our eBook today and bring all of our helpful travel tips and information with you everywhere! When I go on a trip, I like to research what there is to do at my destination. I make a plan of what I’m going to do, what I want to eat and make sure I don’t miss out on something really interesting and fun on my vacation. And most of my research comes from online sources. The problem with getting my information online is that when I’m travelling around a new city, I need an internet connection to access this information. I probably won’t find an internet connection when I need it at some place like Tai Tam Country Park, Repulse Bay, or riding on the MTR. And Roaming charges on cell phones in a different country are super expensive, so I won’t use the internet data on my cell phone either. So to make Hong Kong Trip Guide more accessible to travellers, I’ve taken all of my webpages and compiled them into an ebook. This ebook can easily be imported to any of your mobile devices, such as a smartphone, e-reader, or tablet, for offline viewing. With the Hong Kong Trip Guide ebook, you’ll have all of our helpful information on your favourite mobile device, any time you want it. 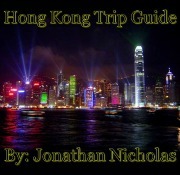 The Hong Kong Trip Guide ebook contains every page available on the website as of December 31st, 2012. For the introductory price of just $9.95, you get 292 pages of helpful travel information from Hong Kong Trip Guide! And as an added bonus you’ll also get the larger pdf images of the MTR map, map of Hong Kong, Stanley Promenade, and Ocean Park map that are available on the website. These are very useful images while travelling in Hong Kong. And whenever I add an update, you’ll have access to the updated ebook free of charge! Please click the Add To Cart or Buy Now button below to Buy the Hong Kong Trip Guide e-Book. Please like us on Facebook to find out when a new update is released. Have any questions before you make a purchase?